Over the past few weeks, I have been participating in an online book study being hosted by the Calgary Science School (CSS). 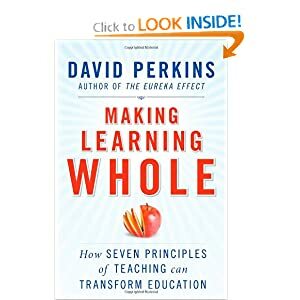 The book we have been studying is called: Making Learning Whole: How Seven Principles of Teaching can Transform Education by David Perkins. I had the pleasure of being the guest blogger for Chapter Six, "Learn From the Team". In my post, I decided to talk about my own school's structure and weave in the concepts discussed in Perkins' chapter. I believe that it is an example of inquiry in action! To read all of the discussion about this book, please visit the book inquiry study site at CSS. If you get the chance to read this book, I strongly recommend it. It is a great read. 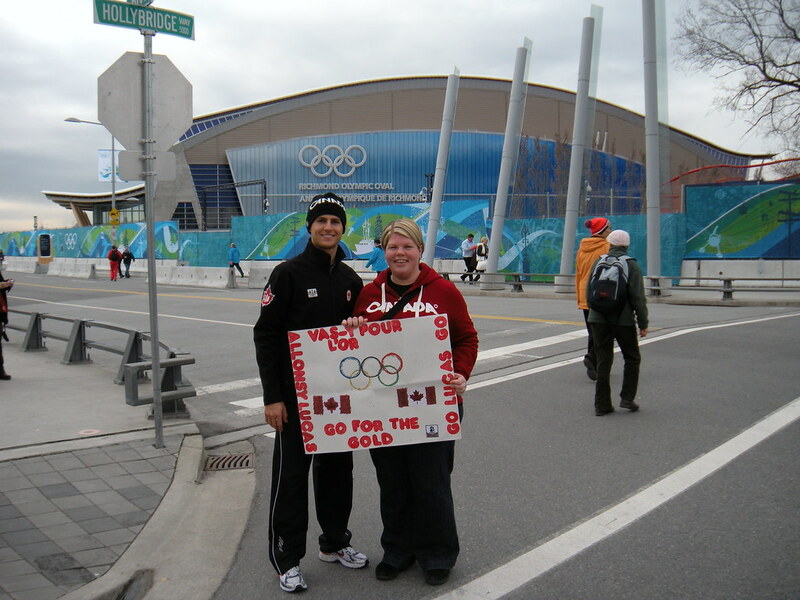 I am a French Immersion Middle Years Educator and Teacher Librarian in Regina, Saskatchewan. I received my B.Ed. from the University of Regina. I am passionate about the integration of technology into the classroom to enable students to think and work together in new ways. 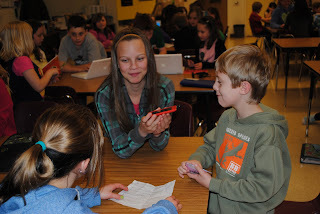 I have documented my journey through my blog entitled “My Adventures in Educational Technology” . In 2009, I won the $20,000 “Best in Class” award from Best Buy for the use of technology in my classroom. 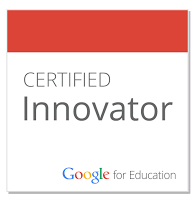 This award enabled me to purchase many new tools for my classroom, including iPod touches and netbooks, which have allowed my students to learn in new ways. You can follow Joanna on Twitter here. I chose this chapter to write about because of its title, “Learn from the Team”. Collaborative learning is a key component to the current environment in my classroom and in my school. Many aspects of this book really resonated well with me because I’m fortunate to work at a structurally innovative school that allows me the opportunity to put many of the seven principles in this book into practice. In fact, after reading Perkins book, I felt that it will be a useful tool to help explain some of the structural changes and practices we are currently implementing at my school. Please indulge me as I share a bit more about the structure I have helped develop at my school while reflecting on Chapter 6 of Perkins book. First off, let me tell you a bit about my school and our structure, as it is far from traditional. École Wilfrid Walker School is a public, K-8 French Immersion Centre in the suburbs of east Regina. All instruction and interaction occurs in French, which is the second language for the majority of our students. Other than a couple of hours a week devoted to English Language Arts instruction, our entire curriculum is in French. In fact, students don’t receive any instruction in English until they are in Grade 3. In this chapter, Perkins begins by explaining the importance of the “Social View of Learning”. In French Immersion instruction, social interaction is crucial to second language acquisition. The premise of this practice is to “immerse” the learner in a new language environment. Students come into the program with no knowledge of the language, but are actually forced to learn and interact using the language before they fully understand it. They rarely receive translations for what they are learning, but instead their comprehension is supported through images, gestures and social interaction to learn new vocabulary and grammar. French Immersion students in fact explore the same concepts other learners in the same grade are learning in English at other schools. In a short amount of time, they become fluent in the language as they are challenged to think and learn in new ways. Perkins begins this chapter by talking about Vygotsky insights into concepts like “social scaffolding” and the “activity theory” and their impact on internalized learning. I believe that learning in French Immersion is successful because students are learning through physical actions and conversations that help internalize the new language that they are encountering. I believe that students would not experience the same successes if they were not exposed to the social aspect of learning through a “social scaffolding” of supports from their peers. What makes my school different from other French Immersion schools across Canada? Social learning is not a new practice and has been important to the success of French Immersion since the beginning of the program more than 30 years ago. The difference at our school is that we have taken social learning to the next level. In 2009, Wilfrid Walker was one of the first schools in Regina Public to experiment with a new structure under our division’s initiative called “Structural Innovation”. Our structure is founded on the principles of flexible groupings, team teaching, student choice, inquiry and project based learning. It is rare to walk through our school and see students sitting in rows listening attentively to a single speaker in front of the room. Usually you see students working together in pairs or in groups on hands on learning tasks or projects. From the early days of Kindergarten, students are “playing the whole game” when it comes to learning French. At Wilfrid Walker, most teachers teach only a few subjects, which is rare in elementary school. This focus allows teachers to become masters at what they do and allow the students the benefit of receiving quality learning experiences from educators who are specialized in the subjects that they teach. Our student body of approximately 250 has been divided up into three grade specific pods (1-2, 3-5, 6-8). Students have a homeroom, but are otherwise grouped and re-grouped during the day depending on the subject that they are studying. These groupings change throughout the year as our calendar has been organized into eight, six week blocks. Although our schedule is blocked into more traditional subject headings, teachers plan as teams to ensure that similar themes are covered through many subjects at once, ensuring students work in cross-curricular situations. They are able to solve problems and apply language skills in math class then later use those same skills to investigate world issues and propose solutions to today’s problems in social studies, science and health. Ideally, students would have exposure and opportunities to work with real experts in their fields. Just like how most educators in Saskatchewan learn to be teachers by doing lengthy internships, we learn best by observing and working alongside veterans in their field. Education students get to apply their knowledge by practicing their skills in the real world and learn to reflect and try again. That is how they become master learners. I think that the next level of Perkins’ described “Communities of Practice” in this chapter would be in the form of team teaching at my school. Not only do we host and mentor our share of university students but being able to plan and teach alongside our colleagues in the same room allows us the ability to see each other in action, to reflect on our own practice and to have opportunity to become better educators. This brings me to the section of the chapter devoted to “Studio Learning.” I feel a particular attachment to this part of the chapter because my classroom does not actually have a number like most others in our school. Its “room number” is actually a name and is called “Studio 1”. It is a place where I spend most mornings teaching social studies and science in mixed grade groupings of students in 6/7/8. Students in my classroom follow the studio model explained in this chapter (demonstration-lecture, students-at-work, process of sharing and critique) to learn about the required curricular outcomes in social studies and science for their grade level. But what does this look like? I start each block modelling and demonstrating what we will be learning about to give students an idea of what it “actually looks like”. Students then use problem solving methods similar to the “Pair Problem Solving” method described in this chapter to work on specific learning tasks to get more familiar with the topic at hand. They collaboratively draft questions and propose hypothesises about the topic. Finally, students choose to work independently, in pairs or as teams to attack larger problems, which are either student or teacher constructed, through lengthy project-based learning periods or student focused work periods, culminating in a peer critiqued sharing event or presentation at the end of the block. The culture of constant feedback and reflection are woven through my classroom. Students have been taught how to give constructive feedback to each other and how to effectively reflect on their own learning. They teach each other how to approach problems in different ways. They also mentor each other to see past what is happening in the classroom and to try to apply their ideas in a real world context. Their journey is documented through learning journals, exit cards and block end reflections. This is my form of “Extreme Team Learning” and is evolving every day and we re-evaluate and try new ways of learning at our school. This type of learning wouldn’t happen if we hadn’t already developed a culture of understanding at our school where students feel supported and listened to, not only by the teachers, but by their peers as well. An open and caring environment is necessary for students to experience success. Finally, my latest experiment is the concept of “Cross Age Tutoring”. Traditionally, this method is used in our school in the form of “Reading Buddies”, a time where older students read to younger students or vice versa. As we focus more and more on the acquisition of 21st century skills, I have developed literacy and numeracy centres where older students work with primary students on acquiring new skills through the use of ipods, laptops and Smart Board. Nothing is more rewarding then hearing older students give feedback or instruction to younger students using the terminology they have learned to use in the “Studio”. The older students often comment in their reflections that they really enjoy teaching younger students new things. This experience gives them confidence knowing that even if they are struggling with concepts and skills at their own grade level, they have come a long way since Grade 1. They also say that they have become better learners themselves watching how younger students learn. I’m not sharing our school’s journey to say that we are the best out there. We have come a long way and have a long way to go. We are constantly learning and growing along with our structure and make changes and improvements all the time. We have developed a structure that works for our students and their needs. As their needs evolve, so will our structure. I’m curious to hear how you interpret “social learning” or “learning from the team”. I hope by sharing a bit about my school, you will share a bit about yours. I am always looking for new ways to approach learning in my classroom and in my school.